It is well known that mulled wine has a positive effect on health. It acts as a liquid antioxidant, and protects the heart and blood vessels. In addition, prevents inflammatory processes in the body, and has a positive impact on high blood pressure. This magic potion can be used to relieve the symptoms of colds. It is also useful in case of slow metabolism as well as decreased libido. Also, herbs that are put into it plays a significant role in the healing properties of this drink. Of course this does not mean that they often need to drink large amounts of mulled wine. Daily is not recommended to drink more than 3 deciliter. This amount is sufficient for the demonstration of their positive effects on our body. Below you can read the recipe for mulled wine with cinnamon, as well as many others. Find out what are it medicinal properties and something interesting on this subject. Scientists have found that in addition to alcohol which has 10-15 per cent, wine contains natural substances that come from the grape. It is rich in vitamins A, B1, B2 and C, with 14 organic acids and 32 amino acids. Largely represented also is calcium, magnesium and iron. Any alcoholic beverage has its energy value. In one liter of wine there is 600 to 700 calories. It contains 800-900 g of water, 50 to 160 grams of ethyl alcohol, 30-150 g of unfermented sugar, 3.5 to 14 g of organic acids (malic, tartaric). It has 6-10 g of glycerin, 1.3 to 4 g of mineral substances, 1-5g of essential substances, 0,707g of tannin. What effect does mulled wine have? The percentage of alcohol in the cooked wine is 7-10 percent. Because of the sugar that is added during cooking, this drink is more quickly absorbed in the intestinal mucosa, and rapidly enters the bloodstream. A quarter of a liter has about 20 grams of pure alcohol. Our body can digest only 0.1 g in one hour per kilogram body weight. So, one man who weighs 80 kg needs 2.5 h. On the other hand woman of 60 kg needs 3h to digest alcohol from 2.5 dl of wine. Mulled wine calorie count is certainly something more than what we wanted, 1 dl on average contains 80 to 100 kcal. This is one reason why it is not recommended to drink it in large quantities. But regardless of that fact, sometimes we need to drink this delicious drink because it has many beneficial effects. Mulled wine as a medicine is effective because of natural antioxidant resveratrol contained in grapes. This active substance prevents sticking of platelets (thrombocytopenia), or excessive blood clotting. It facilitates the work of the stomach and helps in the digestion of meat, due to the very acidic pH. Pepsin in the stomach digests proteins in acidic value of pH 2,5-PH3. While tannins from it intensify the work of the smooth muscle of the stomach and thus speed up the digestion. Hot beverages have a positive effect on the various forms of respiratory infections. So mulled wine is a cold medicine, thanks to the spices, which are an integral part of this beverage. They give it a more efficient effect. Cinnamon and cloves have strong antibacterial and antiviral effect, to disinfect the throat and pharynx. In this way, mulled wine for cough provides assistance, as well as is used against inflammation. This powerful drink improves blood cholesterol levels, but only if you use it to measure. Well, what is the ideal rate and dose that we should have? Daily one cup of mulled wine is quite sufficient. This volume contains a sufficient amount of polyphenols, which have a positive impact on our body. 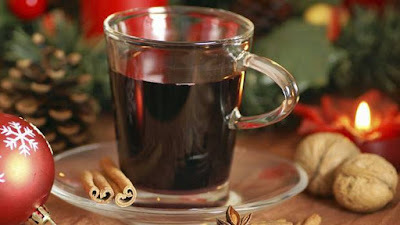 Mulled wine as a medicine encourage the creation of good cholesterol (HDL) in the blood. It keeps the heart and blood vessels, which also makes it more elastic and helps the connective tissue. Additionally, it protects teeth because it neutralizes bacteria in the mouth and thus keeping the tooth enamel. And in the winter it warms us, thanks to the ethanol which increases circulation. In this way, more blood reaches the subcutaneous tissue making us feel warmer. Speed ​​up your metabolism with mulled wine, because it certainly helps digestion. Cinnamon is normally an integral part of many diets. Herbs thanks to its essential oils, stimulate the secretion of our digestive juices. These substances exert their effect in the stomach and intestines. In the case of slow digestion are extremely efficient and helpful. Pay attention, do not put in the preparation large amounts of sugar in warm beverages. It will slow down the digestive system, instead using some other natural sweeteners. Thanks to its antioxidant effect, mulled red wine improves blood circulation. Efficiently warms the body, and because of the alcohol content it reduces tension. In addition cloves increase desire. This combination is favorable for enhancing libido. If you or your partner have such problems, this is very tasteful and practical solution. It is understood that a moderate consumption of one to two cups. In its composition it contains phenolic compounds that have antioxidant properties. They destroy free radicals in the body. Hazardous radicals otherwise damage our DNA, disrupt enzymes, damage cell membranes and the like. Therefore, this drink can help prevent the various cardiovascular diseases, stroke, diabetes and cancer. It also has a positive effect on the stomach, liver and heart, improves memory, neutralize stress and slows aging. Contains very useful spices. Indispensable ingredients of mulled wine are cinnamon bark, Cloves and cardamom. All three spices have antibacterial properties, and its positive effects in this case are excellent when used together. Already in the inhalation of the smell in the preparation of mulled wine we can see that it will have positive effect on us. Essential oils which are released from these aromatic plants, give the beverage the divine fragrance. How to cook the wine in a home version? Typically, this aromatic drink is made with red wine, with the addition of water, sugar and spices. Of these, the most common being added is cinnamon, cloves, cardamom, lemon peel or orange, anise and even nutmeg or vanilla. In some recipes fruit are added. Used is sweetening sugar and honey or other natural sweeteners. Which wine to use, red or white, is basically just a matter of taste. In some areas people prefer variants with red, while the others prefer white. Whichever version of you decide you will not go wrong. You will still get an aromatic drink, with multiple beneficial effects to our health. Take a bottle of red wine or what you like to drink. On the weaker heat, stirring slowly boil it. It is necessary to add 130 g of sugar, 1.25 ml of water, followed by three sticks of cinnamon, clove and 5-6 cloves. When it reaches the boiling point added are rings of sliced ​​lemon, two oranges and diced chopped apple. This is cooked for about 10 minutes until the flavors merge. All ingredients except the gin put in a pot and slowly warm up until the sugar is dissolved. Remove from the heat before boiling and add gin. Serve immediately. half a teaspoon of nutmeg (ground). All the ingredients mix and put in a saucepan and let it boil. When it boils reduce the heat and let it stand for 5-6 minutes. Before consuming you need to strain in. You do not drink alcohol - there is a solution! Wondering how to make mulled wine for the kids and those who do not consume alcoholic beverages? Easy! Today there are already soft or very similar to the original, fragrant and aromatic alternative solutions. The base of these drinks can be fruit teas or juices from apples, oranges, grape juice. Spices that are used are the same as in the case of alcoholic beverages. Mostly they are cinnamon, cloves, cardamom, anise and vanilla, with coils of orange and lemon. What are the experiences of users with mulled wine? A recent scientific study found that the average life expectancy is longer in those people consuming alcoholic beverages. A group of people who regularly drank mulled wine compared to the group who did not lived 10-12 years longer. After this there is no doubt that it is desirable to occasionally drink a cup, regardless of whether it comes to red or white wine. In France, the meal cannot be imagined if it does not go along with a glass of good wine. Just because of it there is the lowest rate of patients suffering from cardiovascular diseases. It is thanks to their habit of regular consumption of this beverage. For a long time I had problems with iron. I nearly got a blood transfusion because of this problem. I drank various drugs but they did not help. Every month due to the cycle my levels of iron decreased. Then my aunt advised me to drink every day 1 dl of mulled wine. After a few weeks I felt much better and stronger. In addition, blood tests have improved. I still occasionally drink half a cup, it is tasty and it strengthens the blood. It is very uncomfortable when you constantly need to urinate. Also, the burning sensation is very irritating. At the suggestion of a friend, I cooked 0,7 of white wine, 4 garlic cloves. After cooking strain the liquid. Morning and evening drink one glass of gin with this drink on an empty stomach. A few days later I was already relieved. Uncomfortable burning sensation is reduced, and less often I go to the bathroom. Mulled wine price and where to buy it? You can buy it in bars, cafeterias, restaurants. For mulled wine price can vary but quality is important. It's all about rates! The wine itself has positive effects on our body and health, and to manifest them we need to drink wine in small quantities. Any exaggeration is not good. Alcohol abuse among other things results in increased blood pressure. Of course children should not drink alcoholic beverages in general, because it is poison for them. The liver in children cannot break down alcohol as adults can. Then, their brain cells are more sensitive, as well as their metabolism, and enzymes. Mulled wine during pregnancy also should not be consumed, but it is not advisable when breast feeding. In no way should you drink alcohol if you have problems with your liver, especially with chronic inflammation, and also in case of inflammation of the pancreas. In people with stomach ulcers it can worsen their disease. Those who have problems with their typhoid gland should not drink alcohol also people suffering from gout. Red wine dilates blood vessels, and those who suffer from hemorrhoids consuming it can exacerbate problems. It is harmful to the liver, while white wine is dangerous with nerve diseases. Interesting fact: in Austria and Germany, the mulled wine as a medicine has been known for centuries. It is a highly popular drink, and annually millions of liters are spent. No wonder, because this fragrant and warm drink, in addition to being delicious has many health benefits. On this occasion, we also recommend our earlier article prescription of Hildegard von Bingen, which is 800 years old.